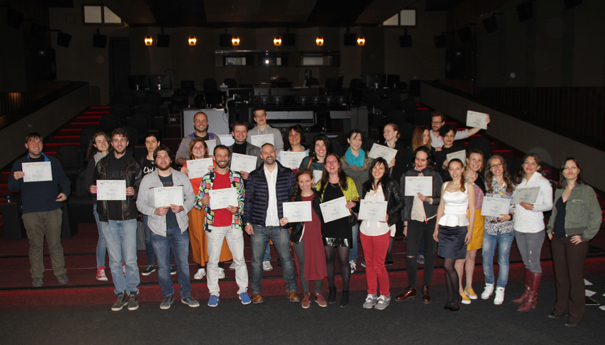 The second batch of screenwriters is fresh out of the Nu Boyana Film School ready to conquer the film industry. It has been 8 weeks of hard work but the scripts are done and this stage of the learning process is over. The Master class ended with four full days of intense table reads of the feature film scripts. It was an insightful moment to witness the first drafts coming to life with the help of professional actors. The relationship between actors and screenwriters is often neglected mostly due to time issues of film production. The cold reading sessions at the Nu Boyana Film School were the perfect opportunity to introduce two very important sides to creating a story. This interaction gives each of the participants an initial idea of the work ahead until the story is ready to hit production. It was fascinating to observe the first tense moments of reading the scripts. Each character started to pop out of the pages more distinctively with the actors slowly gaining confidence. This experience was mutually beneficial. Castings often give actors a nervous sensation, which is reflected in their performances. Past the first script the ice was broken and the tension was gone. Each story’s genre was reflected in the atmosphere of the room. Emotions ranged from exhilarating laughter to unease sensation that could cut the air. The level of concentration was kept professional all four days. Even the youngest participant in the cold reading sessions – the 11-year-old actor Konstantin never lost a line from each read script. Gratification and relief were common reactions amongst the screenwriters when hearing their scripts. Apart from the knowledge gained from their mentor Golan Ramraz the students learned the pressure of writing a feature story under a deadline. It takes some sleepless nights but this is a part of the creative process and the movie business. Now comes the evaluation. The scripts are given to movie professionals and one of them will be chosen and turned into a feature film. The Nu Boyana Film School community has added a few new and very talented members. Looking forward to the stories you wish to tell! Exciting times are coming as the next courses of the film school are just around the corner. Information on what is to follow will be released soon. So all you moviemakers get ready for the next big adventure at Nu Boyana Film School!